The single client access name (SCAN) is the address used by all clients connecting to the cluster. The SCAN name is a domain name registered to three IP addresses, either in the domain name service (DNS) or the Grid Naming Service (GNS). The SCAN name eliminates the need to change clients when nodes are added to or removed from the cluster. Clients using SCAN names can also access the cluster using EZCONNECT. The Single Client Access Name (SCAN) is a domain name that resolves to all the addresses allocated for the SCAN name. Allocate three addresses to the SCAN name. During Oracle grid infrastructure installation, listeners are created for each of the SCAN addresses, and Oracle grid infrastructure controls which server responds to a SCAN address request. 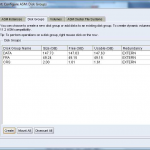 Provide three IP addresses in the DNS to use for SCAN name mapping. This ensures high availability. 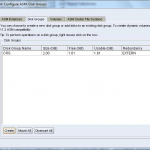 launches ASM configuration assistant to configure ASM and a diskgroup. configuration can be tested as well. # /usr/sbin/prtconf | grep "Memory size"
You will need at least 4.5 GB of available disk space for the Grid home directory, which includes both the binary files for Oracle Clusterware and Oracle Automatic Storage Management (Oracle ASM) and their associated log files, and at least 4 GB of available disk space for the Oracle Database home directory. An Oracle RAC database is a shared everything database. 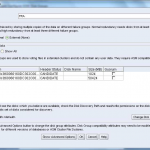 All data files, control files, redo log files, and the server parameter file (SPFILE) used by the Oracle RAC database must reside on shared storage that is accessible by all the Oracle RAC database instances. 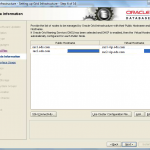 The Oracle RAC installation that is described in this guide uses Oracle ASM for the shared storage for Oracle Clusterware and Oracle Database files. 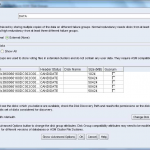 The amount of shared disk space is determined by the size of your database. Three single client access name (SCAN) addresses for the cluster. The Oracle Grid Homes binaries are installed on the local disk of each of the RAC nodes. # mkdir /u01/app/cfgtoollogs --needed to ensure that dbca is able to run after the rdbms installation. Execute orainstR00t.sh and root.sh on all RAC NODES. 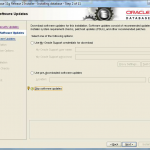 Changing groupname of /u01/11.2.0/oraInventory to oinstall. Successful addition of voting disk 3ac4a8d317664f69bf93e37655b7039f.